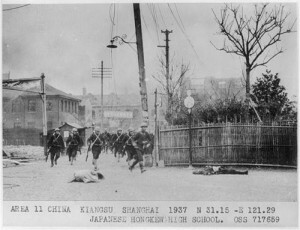 Today a picture of Japanese troops moving through Hongkew in 1937 at the start of the war in China and the assault on Shanghai. The school they are moving past is the Anglo-Chinese High School on Range Road (now Wujin Road) run by the Church Missionary Society, originally founded in 1850. I’m not sure how much of that school still exists – it was the No.2 Primary School in the 1960s and is now part of the Jiaotong University medical school (I think).